Take this versatile white modern subway marble mosaic backsplash tile to create the modern kitchen of your dreams. 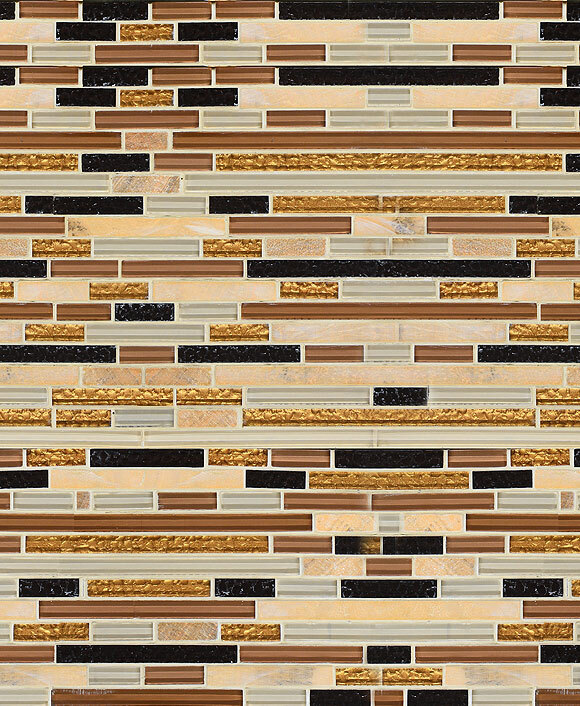 Paired beautifully with any number of modern designs, the elegant and polished finish of this contemporary tile will become a sophisticated centerpiece in your kitchen as a backsplash or an accent wall. We’ve compiled a few finished rooms to give you the best ideas for how to decorate your home with this stunning subway marble backsplash tile. 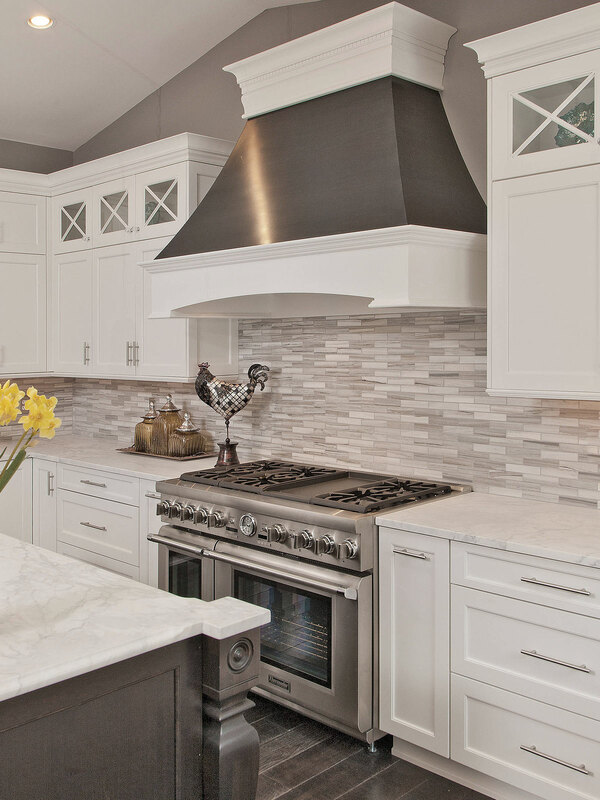 Ideal for classic white cabinets in simple designs, this modern mosaic tile matches well with shaker style cabinets and sleek stainless steel hardware. The earthy gray tones swirled throughout this beautiful marble will beautifully complement the white Carrera countertop for swirls of sophisticated color. Stainless steel gas appliances give your kitchen a professional feel, while the various knickknacks that adorn the counters provide a few fun conversational pieces and bright accent colors. Beautiful pendant lighting will keep your low-maintenance subway marble tile shining. Another amazing modern kitchen design pairs the white modern subway marble mosaic backsplash tile with beautiful medium brown cabinets. The earthy brown veining within the backsplash tile works well with naturally colored cabinets for a contemporary feel. Opt for simply styled cabinets without intricate patterns on the doors to keep your design feeling fresh and clean. 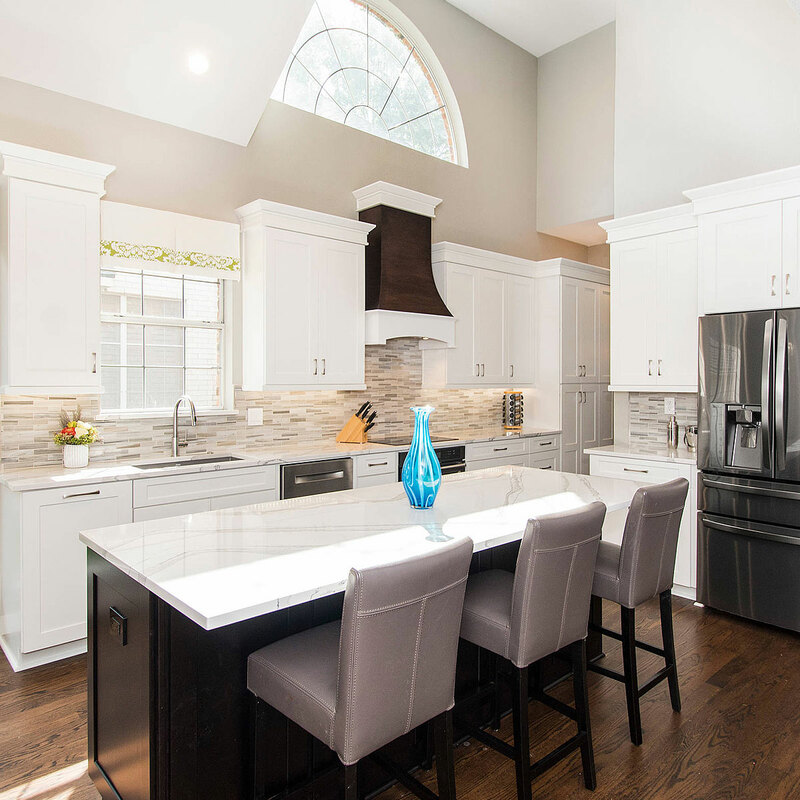 Let bright white granite countertops or quartz countertops make this backsplash shine by highlighting the pure white, a timeless look for any space. Trying to find a way to use a darker neutral color scheme in your modern design? Choose dark gray cabinets to highlight the dark pieces of marble that are scattered throughout this pattern. The dark gray cabinetry with clean white quartz countertops will make these pieces pop and lend a contemporary air that is dark yet sophisticated. Stainless steel appliances and open shelving adorning a powerful interior accent wall highlight the natural beauty of this polished tile. 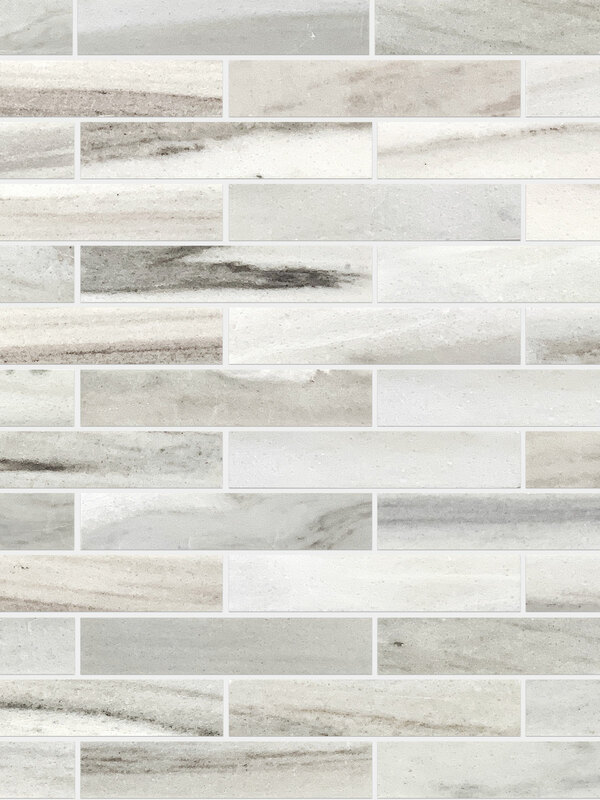 Mix up the different modern styles with this adaptable white modern subway marble tile. Have a little fun experimenting with the different color combinations — almost anything will look amazing! Because of the natural combination of earthy grays and browns swirled with crisp white, almost any color palette will be well suited for this backsplash tile. 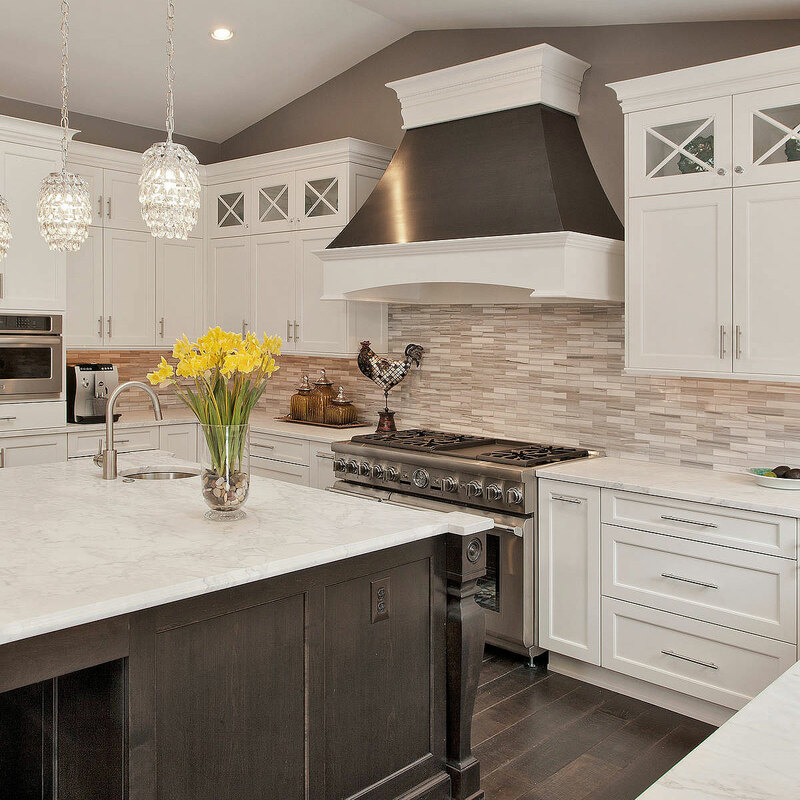 A dark gray or earthy brown granite countertop paired with white cabinets will look stunning. Even darker countertops, mixed together with specks of gray and flecks of beige and espresso brown will look gorgeous against this backsplash tile. 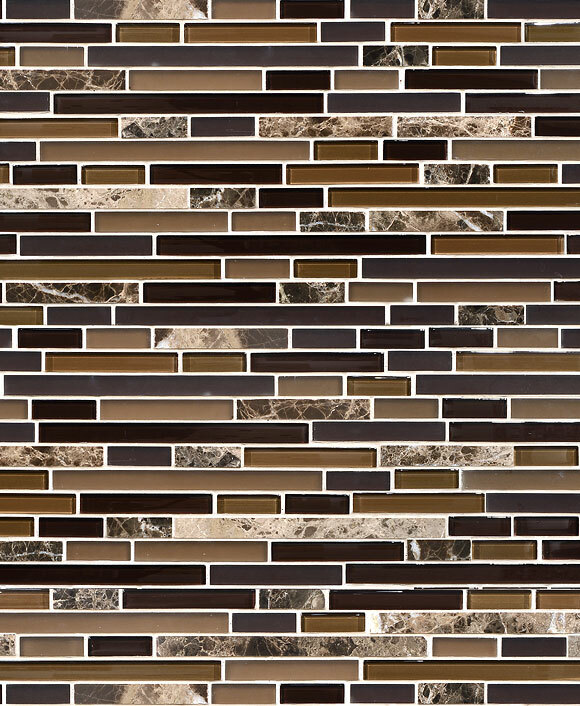 The strong horizontal movement and clean design of the mosaic tile will make any combination feel effortlessly modern. Consider cabinets and appliances that meet flush for a neat, clean look, ideal for modern spaces. No two pieces in this pattern will be exactly the same because each piece of marble is uniquely finished for a sophisticated, high-end design. Easy to pair with almost any combination, this white modern subway marble tile is versatile, easy on upkeep, and elegant. Designing a modern space is easy with the clean lines and simple refinement of this stunning subway marble backsplash tile. 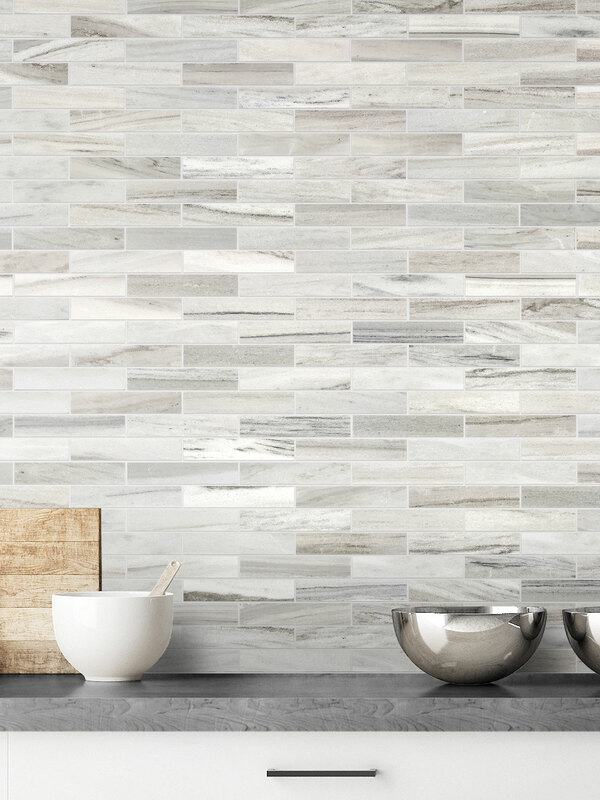 This marble modern backsplash tile has a color palette that is classic and timeless, sure to be a stunning feature in any contemporary kitchen. This entry was posted in BRICK, GRAY, MARBLE, MODERN, SUBWAY, Uncategorized, WHITE. Bookmark the permalink.